I'm having serious earthing problems which are making it difficult for me to record a clean guitar sound with my Boss GT6 effects and Roland GR20 guitar synth. There's a bad earth buzz that only stops when I'm touching the guitar with both hands. As you can imagine, this is frustrating because every time I change a chord or lift my finger for a split second there's a 'click'. All my leads are good, and I don't have this problem with any of my other equipment — just the guitar stuff. The Line 6 Pod Pro has the same problem, which increases and decreases when I move around the room. Even if I do find a spot where the buzzing stops for a bit, the slightest thing will set it off again. The problem is there regardless of whether the units are connected to the mixer or not, and the power supplies are completely separated from any of the other equipment — they have their own dedicated, regulated plugboard going into its own dedicated mains outlet. Could it be a problem with my domestic mains supply? Any advice would be greatly appreciated, especially if there would be a cheap way of fixing it. 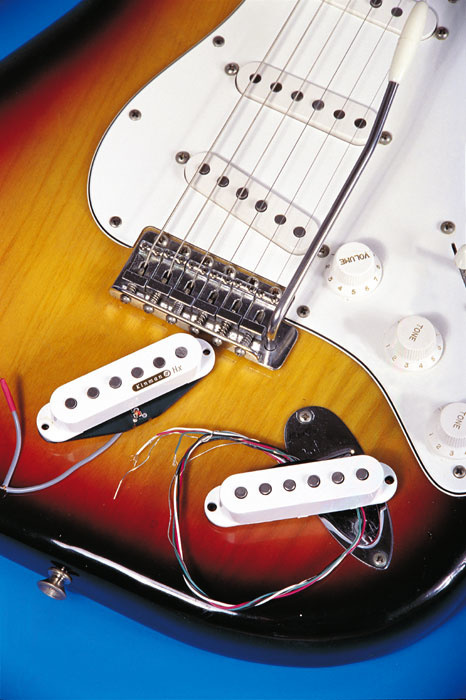 Editor-In-Chief Paul White replies: You don't say what kind of computer monitor you are using, but it's a well-known fact that CRT (as opposed to flat-screen) computer displays interfere badly with guitar pickups, especially single-coil pickups, though humbuckers are not completely immune. Kinman's AVn pickups use a stacked-coil design to combat hum.If the hum changes in character and intensity as you move around the room or even when you face in different directions, this suggests that you are picking up radiated interference rather than something coming in via the mains — mains hum wouldn't be affected by your position in the room. Other sources of this kind of interference besides CRT displays are any pieces of kit with transformers inside, which includes powered monitors and power adaptors and especially room lighting dimmer switches. Incidentally, I've also come across some power adaptors that do put interference into the mains circuit when they're plugged in. So it could also be worth unplugging as much gear as you can, testing the guitar signal path, then, if it is quieter, plugging the other gear back in one piece at a time and see when the interference begins. You may well be able to identify a faulty or sub-standard adaptor this way. There's not much you can do to resolve the problem without incurring some expense! Obviously, the best outright solution would be to replace your CRT display with a TFT flat-screen model. Another, and probably cheaper option is to modify your guitar, installing humbucking pickups and lining the cavity which houses the pickups and electronics with insulating copper foil. 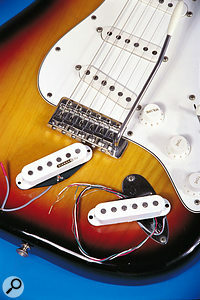 If you don't want to give up the sound of your single-coils, we did review two sets of stacked-coil Strat pickups — Dimarzio's Virtual Vintage pickups and Kinman's AVn pickups — back in our November 1998 issue, designed to get rid of hum without compromising on the classic Strat sound, or looks, for that matter. The other factor that may be aggravating the situation is the quality of the mains earth connection itself. It is worth using an illuminated socket tester to check that you have ground in the first place, though that in itself doesn't guarantee good results. As always, if you feel unsure about anything electrical, get hold of a qualified electrician. In some circumstances, you may get better results by burying a separate earth rod in your garden or basement and using that as your studio ground. As a rule, the damper the ground, the better the earth.